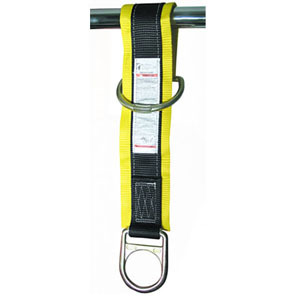 2' Pass-Thru anchor sling is constructed using heavy-duty 1-3/4" polyester webbing sewn on to a 3" wear pad. Uses on standard D-ring for connection to deceleration device and one large D-ring for pass-through/wrap around cinching. •Ideal for I-beams and other properly rated structural members. •Economical and light weight: can be used over and over again. •Wear pad protects primary webbing from cuts and abrasion.